Privacy oriented communication in social network has been researched extensively due to the dangers of private and personally identifiable information falling into wrong hands. 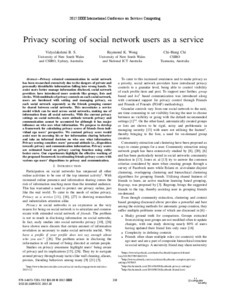 To assist users better manage information disclosed, social network providers have introduced more controls like groups, lists and circles.With multitude of privacy controls on each social network, users are burdened with setting and managing privacy, on each social network separately as the friends grouping cannot be shared between social networks. This necessitates a service model which can be used across social networks, making use of information from all social networks. With the current privacy settings on social networks, users attitude towards privacy and communication cannot be accounted for although it has major influence on who sees what information. We propose to develop a framework for calculating privacy scores of friends from individual ego users’ perspective. We contend privacy score would assist user in assessing his or her information sharing behavior and take an informed decision on who sees what information. Privacy scoring considers users’ personal attitude i.e., disposition towards privacy and communication information. Privacy scores are estimated based on privacy scoring function using cubic bezier curve. Our experiments highlight the effective working of the proposed framework in estimating friends privacy scores with various ego users’ dispositions to privacy and communication.